It’s National Gum Care Month. Let’s a moment to talk about why it’s so important to take care of your gums. Gum disease affects almost half of adults over age 30 and approximately 70 percent of adults over age 65. The first stage of gum disease is called gingivitis, an inflammation of the gums. With gingivitis, gums can be red and puffy, and bleed easily when brushing or flossing. If gingivitis is not treated, it can progress to periodontitis, where the structures supporting the teeth, including the bone, begin to break down and be lost. 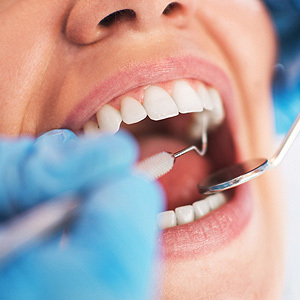 Advanced stages of gum disease can lead to tooth loss and general health problems. The good news is that gum disease is treatable — and early gum disease is even reversible. So what can you do to take care of your gums? Be diligent about your oral hygiene routine at home: Your first line of defense is your oral hygiene routine at home. Brush your teeth gently morning and night, using a soft toothbrush and fluoride toothpaste. Brushing too vigorously can harm your gums and cause them to recede. It is also important to floss every day to dislodge plaque that can build up between the teeth and around the gum line. Come in for professional dental cleanings and exams: Schedule regular professional cleanings to remove the plaque that is hard to reach. If plaque is not removed, it can harden to form tartar (or “calculus”). Only professional cleanings with special dental tools can remove tartar. When plaque and tartar form below the gum line, your bone that supports the teeth may be at risk. We can examine your mouth above and below the gum line to detect and monitor any signs of gum disease and recommend appropriate treatments. We are always happy to talk with you about how to maintain the health of your gums. Remember that early gum disease is very treatable, so take care of your gums, and they’ll take care of you!